pink | I Get Dressed In The Morning! I have a mega huge love affair with Illamasqua make-up. Before I discovered Illamasqua I felt like doing make-up was something only big girls knew how to do and that I simply wasn’t enough of a proper girl to have a clue! 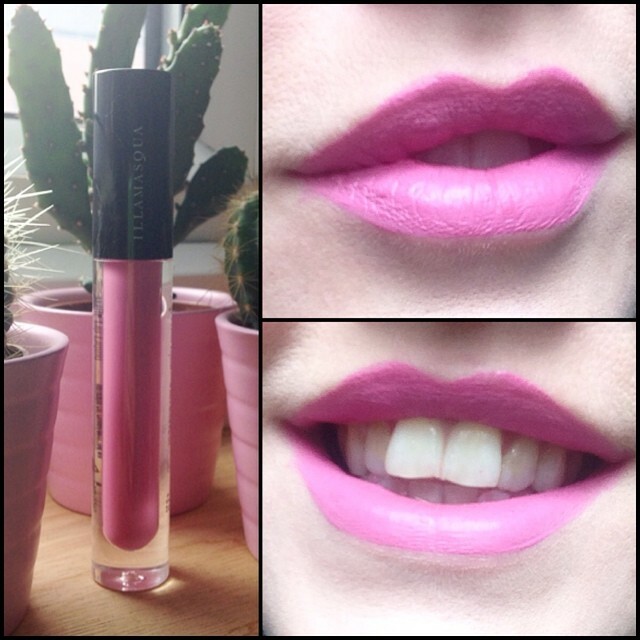 The day I walked into Illamasqua, I discovered that there really is no definite ‘right’ or ‘wrong’ way! I now seem to know the girls at the Leeds branch so well I’m on first name terms. I have gone from not having a clue and kind of just slapping stuff on my face, to actually spending evenings free (when I ever have any), experimenting with make-up just for fun! As a brand, they support all the things I support, individuality, experimentation, self-expression, fun and also have a really good sense of community surrounding them. I never thought there could be such a thing as a make-up ‘fan’ but I am the HUGEST fan of Illamasqua. I don’t have a big sister, so I feel like they’ve taught me everything I should have learned if I had. Two days ago I bought the Powder Blusher Duo in ‘Ambition & Katie’ and the ‘Speckle’ nail polish, both from their new ‘I’mperfection’ range. I had been entranced by ‘Ambition’ blusher for a while as it has existed on it’s own previously. It is a coral shimmer blusher with teeny gold flecks in it. I would stare at it and imagine I would have magical mermaid cheeks if I bought it. It was released in the new collection alongside ‘Katie’ in this duo. 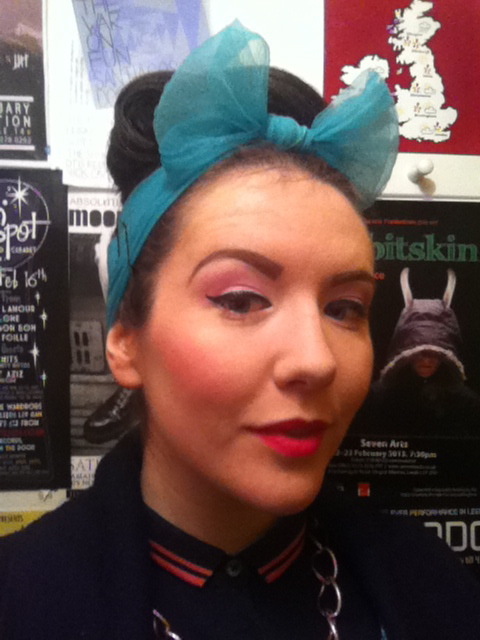 Katie is a wonderful icy pink blush meant to highlight your cheekbones. I was given a demonstration in store using the new ‘Blush Up Brush’, and tried to recreate the look using my normal blusher brush and it really isn’t the same, so as a mini review.. I think the Blush Up Brush works miracles on my face I can’t even explain! Here is my attempt with the new duo..
It’s not perfect by any means, and the lighting could be better but hopefully you get the jist! This is a great product to experiment with, the two contrasting shades give you plenty of scope to try out different quantities of each to get the right look for you. The ‘Ambition’ colour seems more powdery than ‘Katie’ and my brush picked it up as soon as it touched it. The glitter caught the light throughout the day in a wonderfully subtle way and it made me feel all glowy! 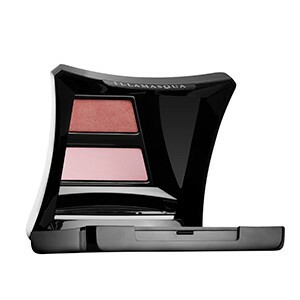 This is the first time Illamasqua have done a blusher duo, so I expect they may be doing more in future collections! I love this product, also in the new range! As far as i’m aware, no other company has ever made an eggshell nail polish before, I think it’s really innovative and certainly looks adorable! It’s limited edition though, so try get your hands on some quick! 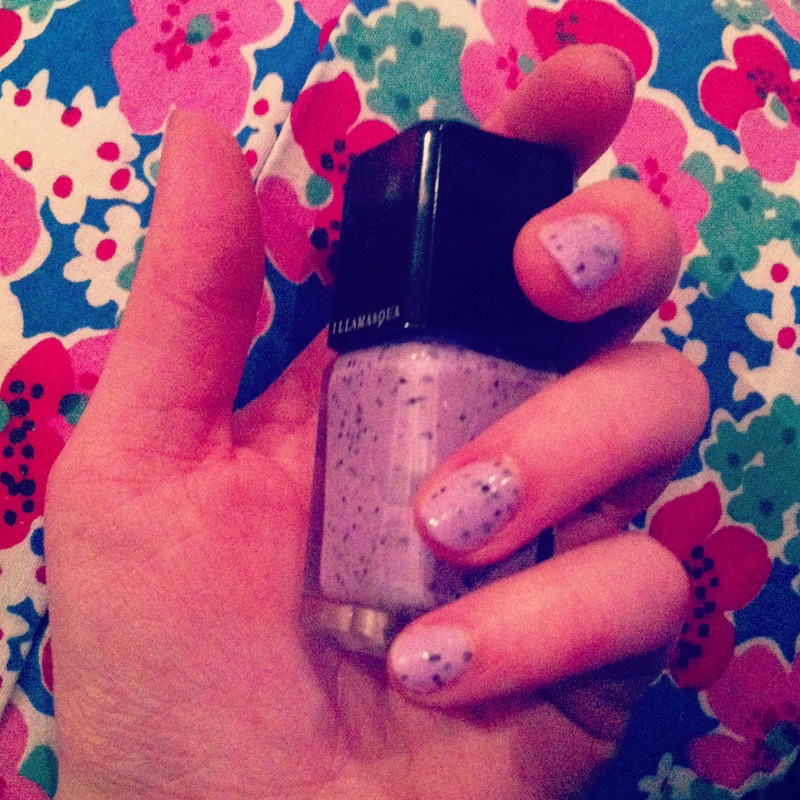 I painted my nails in Speckle last night, and since worked a full day in a busy shop. They have chipped, and I did have to repaint a few but to be honest, that could be to do with me not using a basecoat, and topcoating it with some weird Sally Hansen stuff I had lying around. I would imagine if you used Illamasqua base and top coats too it wouldn’t behave in this way! The brushes on the Illamasqua polishes make painting your nails so super simple! I’ve found these particular pastel and light colours work well to make short nails look a little more elegant too! Well there’s my round-up of my new Illamasqua haul! Overall, very good products as always.. I’ll be hitting up YouTube for some blusher tips and also experimenting with base and top coats to make Speckle last longer! Did you buy any of the ‘I’mperfection’ collection? How do you like it?